20 x 14 in. $85, and 13 x 9 in. $65. Under a myriad of stars in the December sky, the 767' S/S Kaye E. Barker of the Interlake Steamship Co. navigates into the Duluth Ship Canal, passing between the North Pier Light and South Pier Lighthouse in Duluth, MN. Above the South Pier Lighthouse and in the southern sky is the constellation of Orion the Hunter, noticeable by the 3 bright stars in his belt. 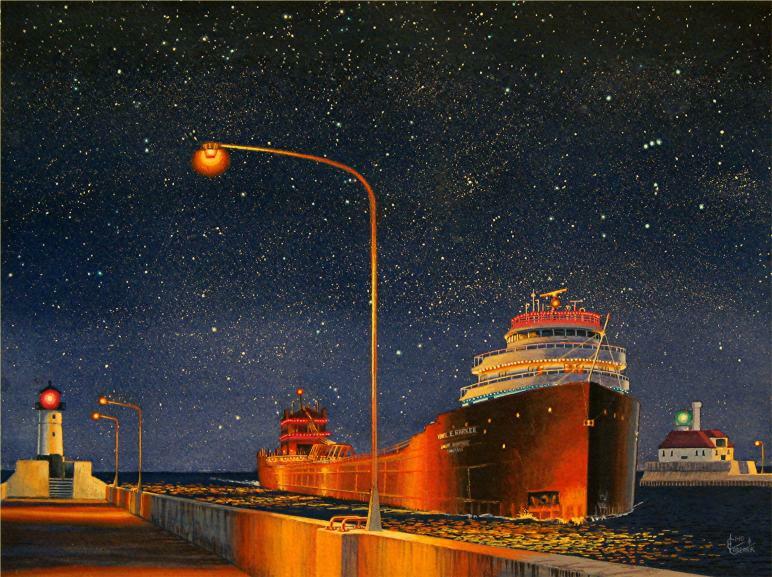 Only days before Christmas Day 1999, the brightly lit and holiday decorated vessel is inbound with limestone loaded at Rogers City, MI and headed for the Murphy Fuel Dock in Duluth. Once refueled, the Barker will shift over to the Cutler-Magner cement dock to unload the limestone then move over to the Superior Midwest Energy Terminal to load low sulfur western coal, both docks in Superior, WI. The coal will then be transported to the Presque Isle Generating Plant in Marquette, MI and after unloading, the vessel will shift over to the nearby Lake Superior & Ishpeming Railroad Dock to load iron ore pellets for Essar Algoma Steel in Sault Ste. Marie, ON.